Forecheck; speed; positioning; board play; powerful slapshot; doesn’t take many penalties. The one we call Dupes was dead consistent in his second full season with the Pens. He scored 9 of his career high 18 in the first half of the season and 9 in the second half. He played 10 more games this season and put up 10 more points. Likewise, he was able to increase his shooting percentage from 8.3% to 11.5% from the prior year. Furthermore Pascal was 3rd on the team in game winning goals (5). Last year he was chided by many Pens fans for not having good enough hands to puck the puck where it needed to be. The biggest issue I felt he had last season was his inability to get a clean shot off, seemed almost all of them were getting blocked. 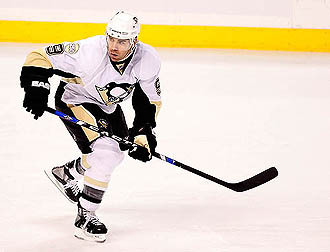 But this year we saw a little more out of Dupuis and a little more promise. Coming just shy of hitting the 20 goal mark for the first time he was able to teater between the first and second lines while Kunitz was out and when Fedotenko was taken off Geno’s line. Just the "Little engine that could" award (PensU Team Awards). This is the final year Dupuis is under contract with the Pens, and at the age of 31 its real important for him to have a good year and land a more sizable contract heading into his 30s. Though like Tyler Kennedy, Pascal is going to have to make sure he continues his consistent scoring if he’s going to find a home on the second line with Geno and company. Bylsma doesn’t mess around. If you start to show any level of inconsistency, you’re out. And truthfully, if that be the case, he might find himself in another uniform before the trade deadline. If Dupuis can continue his hot streak and light the lamp 20+ times this year, $1.4MM will be all the more worth it. Otherwise 18 goals and 38 points is more than expected for a guy at his salary. He’ll certainly start off a Penguin, but as I said above, if he’s not careful he’ll find himself in a different locker room come early spring. We’re confident that won’t be the case.